Logitech has revealed its latest mechanical gaming keyboard, and it’s an understated, sophisticated piece of kit that’s packed with features aimed at gamers - making it suitable for both work and play. And one of the best aspects of G810 Orion Spectrum is that is will be one of three Logitech keyboards to ship with a free copy of Tom Clancy’s The Division. While the G810 is a full-sized keyboard, it’s efficiently compact and sleek – no extra macro keys (the function keys can be used to serve as macros) or unnecessary bells and whistles taking up desk space. The minimalist design means it wouldn't look out of place in an office or any other professional work area. According to the press release, the Orion Spectrum features Logitech’s Romer-G mechanical switches to deliver near-instant responsiveness, registering key presses up to 25 percent faster than standard mechanical switches. The company says the Romer-Gs are similar to Cherry Brown switches – my personal favorite – and they even have dual actuation points, meaning that if there’s a failure in one, the other can still respond to the input. 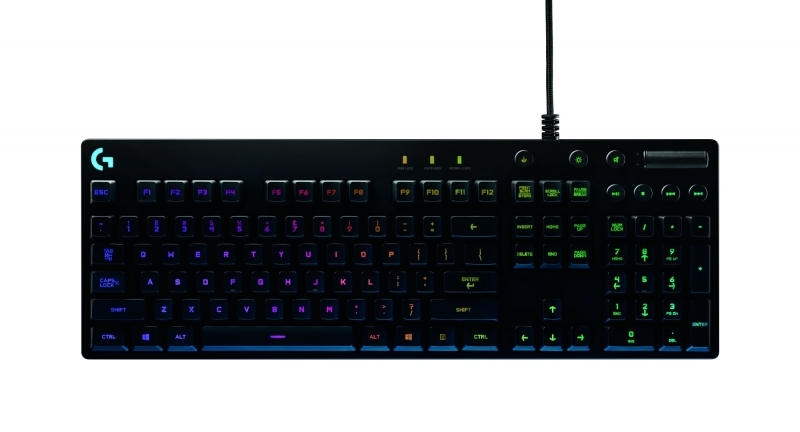 Like some other top-end keyboards, the G810’s individual key lighting can be customized, in this case using Logitech Gaming Software to display any of more than 16.8 million colors. It’s also possible to synchronize the lighting effects with other Logitech G gaming peripherals. You’ll also find the usual selection of dedicated media controls and a volume control wheel in the top corner – a feature common in many full-sized keyboards such as the Corsair K70. There’s even a ‘gamer mode’ button that disables any number of keys, determined by the user, so you don’t accidently switch out of a game – so no more screaming at the screen if you hit the Windows key during a multiplayer online game. The majority of today’s mechanical keyboards aren’t cheap, and the G810 is no exception; it’s expected to be available in the US from February 8 at around $160, although the fact that you’ll also get The Division (providing you order before April 1) does sweeten the deal. The promotion is also available in the US with the $180 G910 Orion Spark.